Season 13 of PokerStars� European Poker Tour begins this August in my favorite city out of all the cities I've visited in Europe, Barcelona. This tournament is always well attended and it's clear that I'm not alone in my assessment of Barcelona as a great vacation spot. The location for the event couldn't be more perfect. You walk outside the hotel and are right on the beach. Tons of restaurants all lined up with a wide variety of cuisine from middle eastern to Japanese. If you like to party, the clubs right on the beach are, in a word, insane! Things are a bit different than what you may be used to if you are an American going for the first time. If you show up to a club at midnight you may think to yourself, "Where is everybody?" By 1am until sunrise, the places are all just packed and the energy is unlike any you've experienced. Have I mentioned how much I love Barcelona? This promotion ran for last season's EPT Grand Final in Monte Carlo and it was a huge success! There were 121 spin and go qualifiers in the event making it the largest EPT Grand Final we have had in a very long time. What really stuck out to me as different, or special, about this event, was the amount of new players I'd never seen before; some playing their very first live event! Knowing that there would be an added boost to the prize pool thanks to the promo, all the biggest names in the game made it out there to take advantage of the added value. 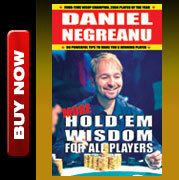 After all, it's not like these Spin & Go players all played like Jason Mercier! I don't say that to be patronizing, but obviously professional players are going to have a better chance at reaching the final table. Having said that, one of the Spin N' Go qualifiers DID make the final table! His name was Asan Umarov and he turned �10 into �305,660 with all expenses paid. Throughout the week I ran into so many new players playing their first event that I had an idea, since I'm sure a lot of the qualifiers were really nervous playing in the EPT Grand Final main event, I thought it would make sense to do an exclusive Q & A session with the qualifiers before the main event started to give them that extra boost of confidence and help them out a little with their poker game. 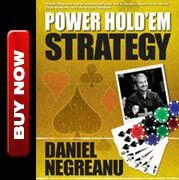 Poker's health and growth is only as strong as the base of recreational and new players who come into the game. When I heard about the Spin & Go promotion, and then saw how great it worked out in Monte Carlo, I wanted to make sure any and everyone interested knew about it. Good news is, there is still enough time to qualify on PokerStars. The bad news is, you better get cracking because it ends July 31st!